Mr. Pecchia came into the movie business by accident. Around 1920, a man who was renting Pecchia’s building owed Pecchia money. Unfortunately, (or fortunately, depending on how you look at the story) the man had no money and paid Pecchia with a theater in Orting. Mr. Pecchia, who hadn’t even seen a “rolling movie” learned about the industry quickly. In 1922 he opened a theater in Kapowsin and bought the the theater in Eatonville. In 1925 he purchased the Morton theater and then took over Randle’s in 1937. In 1949 he built The Narrows, the theater near the Narrows Bridge, which I believe today is the Tacoma Musical Playhouse. 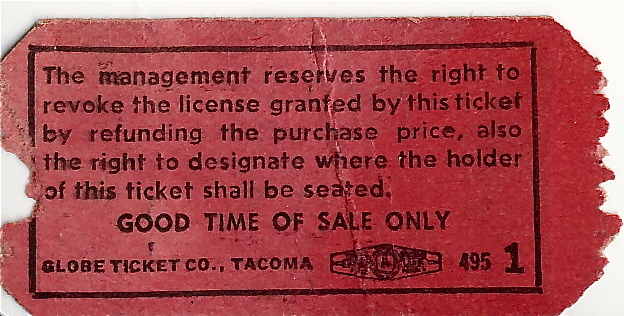 Mr. and Mrs. Pecchia continued to run the Eatonville Roxy until the late 70s. I wish we still had cheap tickets!! But of course it would have been about $2.00 now!! Rich, thank you for the catch.